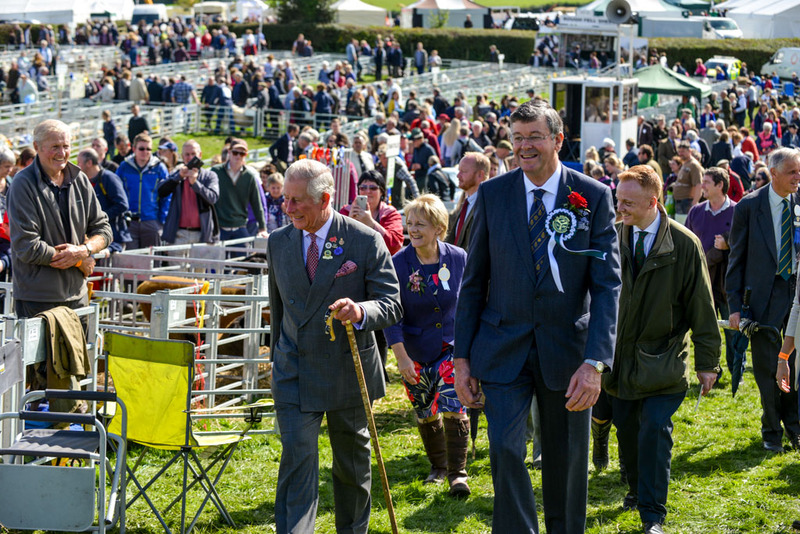 Beautiful sunshine and blue skies welcomed The Prince of Wales to the 218th Westmorland County Show this year. Arriving by helicopter, The Prince made his very first visit to the Show on Thursday 14th September and was greeted with a warm Westmorland welcome by Chief Executive Christine Knipe, Society Chairman Stephen Procter and President John Geldard FRAgS, who accompanied him on his tour of the Showground. The Prince’s visit included some of the many highlights at the Show, in between taking time to talk to many of the producers, exhibitors and visitors. After visiting the sheep lines, The Prince of Wales made his way to the cattle lines where he spent time talking to exhibitors, famers and their families about their livestock. Sponsored by Carrs Billington, the Holsteins come out on top in the dairy lines, with Interbreed Dairy Champion awarded to Tom Stable of Ulverston with home-bred fourth calver Bolton Manor Damion Sadie 3, whilst Ben Richardson’s Limousin Mystyle Maitoi took poll position in the Interbreed Beef. Reserve Dairy Supreme and Red and White Champion went to P.D and B.S Lawrence with second calver Newera Adventure Deal Red. 2017 saw the introduction of a brand new breed team trophy, for the best team of four cattle which clinched by the Limousins, whilst the best pair of cattle awarded to Mr Loftus and his British Simmentals. Although cattle entries were slightly down, interbreed judge Michael Eavis commented that the standard was extremely high. In the pig rings, both the traditional title and overall champion was awarded to Brian Merry’s Middle White gilt Pinehurst Alma Rose II, who has had a fantastic year, winning Breed Champion at Royal Bath and West Show, and Reserve Champion of Champions at the Great Yorkshire. Entries across the Light Horse section were very healthy, with the supreme title taken by Mrs Abba’s Show Hunter Pony Fleetsmore Fire Cracker, ridden by Olivia Taylor. Although the show jumping was called off due to ground conditions, competitions went on well into the afternoon, whilst the sun shone down on the Showground. In the Cumberland and Westmorland Wrestling ring, Graham Brocklebank won both the 13 stone and under and the 14 stone and udder categories, with Jack Brown presented with the James Cropper trophy for Most Meritous Performance, and Thomas Davidson scooping three trophies for the juniors. Prince Charles stopped for a photograph with the competitors and presented prizes for the under 15’s category. Around 30,900 visitors streamed through the gates to take in the sights and sounds of what proved to be a fantastic day for all involved. Classes and entertainment in the Main Ring proved popular and the new Equine Village was hailed a success whilst allowing for more space on the Showground, which was bustling with activity. Food Theatre audiences were wowed with appearances from Phil Vickery, whilst the quality of exhibits and displays within the marquees improves each and every year. The larger Forestry Arena attracted great crowds, with demos from the Cumbrian Axemen and horse logger George Newton. The Rural Crafts marquee continues to thrive and demonstrators were thrilled to meet Prince Charles as he made his way around the Countryside Area, commenting on how important it was to keep the skills going and to pass knowledge on to younger generations. A huge thank you to all the visitors, exhibitors, volunteers, stewards and judges who gave up their time to support the Show. Next year’s will take place on Thursday 13th September; we hope you have the date in your diaries!